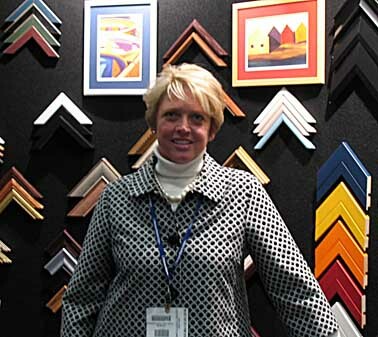 The 2008 West Coast Art & Frame Show was a visual feast. Thousands of framing and art industry professionals met in the Las Vegas Hilton to trade ideas, launch new products, and to develop and strengthen relationships to meet the challenges of 2008. I will try to cover some of the exciting new products and their implications in a later post, but I wanted to capture my impressions of the fashion statements being made by convention-goers and other Las Vegas visitors. 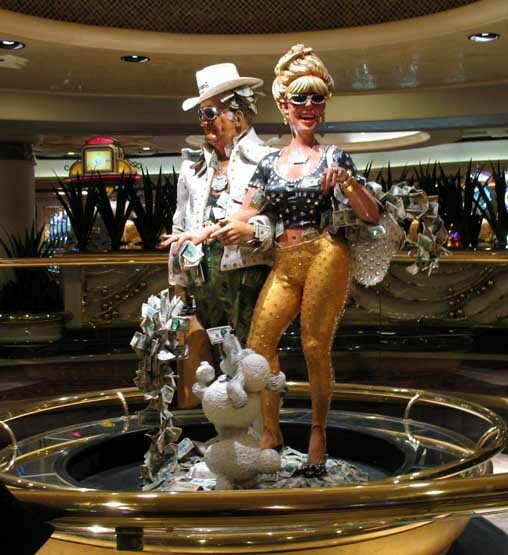 The image at the top shows statuary in the lobby of the Mirage Hotel in Las Vegas which affectionately portrays the high rollers who were the basis of the original Las Vegas economy. While a few Las Vegas visitors still carry on the grand tradition of wearing glitz and glitter that rivals onstage performers, most of the visitors I saw presented a vastly different appearance. Gene Eichner, Co-Chairman of Framerica, one of the major exhibitors at WCAF, provided one of the best examples of understated sartorial elegance at the show. Impeccably tailored, his passion for his company and his customers comes through at first meeting. There were so many stylishly dressed buyers examining art in the Convention Hall that some areas looked like a gala gallery opening. These smartly turned out men and women gave the WCAF convention a distinctively cosmopolitan flavor. Booth personnel, on the other hand, were dressed in a wide range of attire from business suits to T-shirts. Essentially, they were dressed for work and their attention was on presenting their service, like Tami Elhart, a marketing manager at Kandu, a non-profit organization in western Michigan which employs the handicapped. The vast majority of convention attendees were dressed for modern airline travel: jeans and sneakers, with an occasional sports jacket crammed with literature. These were mostly small business owners and they came for information, not to put on a fashion show. 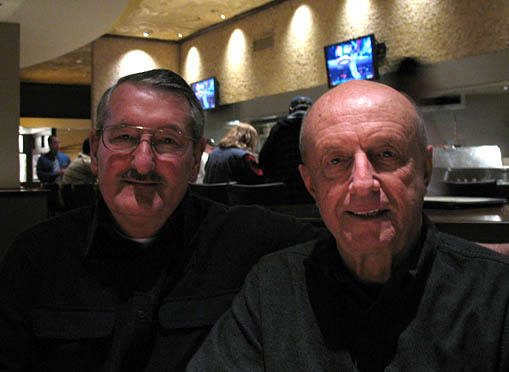 Many of these attendees looked just like me and cousin Martin Picard, seen here dining at the California Pizza Kitchen in the Mirage Hotel. From our attire, we could have just as well been sitting in the Blue Ridge Restaurant in Floyd, Virginia. Speaking of airline travel, there are few vestiges of the fashions that prevailed when I first started traveling for business in the mid-Sixties. We travel in jeans and sweats now and flight attendants rarely present the visual delights that stewardesses did in the early days of air travel. 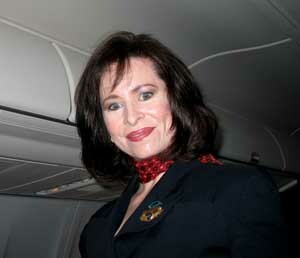 Huge jets and demanding schedules have demanded a different skill set for airline personnel and you rarely see someone who looks like this charming AirTrans flight attendant any more. That’s a pity. We need beauty in all aspects of life. We all need to be stylin’ in one way or another. This entry was posted in The Changing Workplace, Travel Blogging and tagged AirTrans, Blue Ridge Restaurant, Flight Attendants, Floyd Virginia, Framerica, Gene Eichner, Kandu, Las Vegas Hilton, Martin Picard, Mirage Hotel, Tami Elhart. Bookmark the permalink. Happy you’re back. Everyone needs to get off the reservation once in awhile. What’s with the little blue hat you’re wearing?